Who Loves Dogs? El Portal Sedona Hotel – That’s Who! Some of our favorite guests are of the four legged variety! We love dogs, cats, we are simply animal friendly (we’ve even had a monkey stay at El Portal). But you don’t have to believe us, read about how this dog lover feels about El Portal. “We love to travel with our dogs! We have been amazed at the amount of places that allow us to bring not one, but two 70 lb Golden Retrievers along with us. Here are some of our favorite places to stay with the pups, as well as some great resources to find Pet-friendly rentals/hotels. Brad and I got engaged in Sedona, so it is a very special town for us. It’s a quick 2 hour drive from our home in Phoenix, and is a very dog-friendly town. Where to stay: We love El Portal! They welcome dogs of all sizes, and go above and beyond to ensure your pups are well taken care of. They even had some welcome treats for the dogs when we walked in our room. Each of the guestrooms are unique, and are stunningly beautiful and cozy. We went for our 1 year Anniversary and stayed in the Juniper room – had an amazing stay! 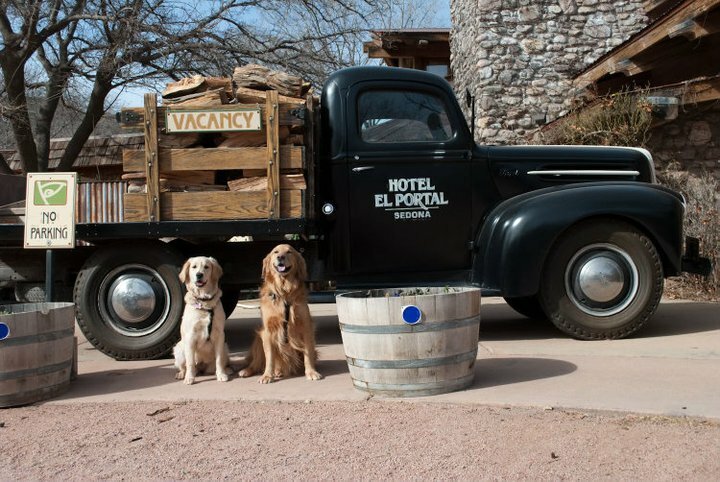 El Portal is a pet friendly bed and breakfast, a 12 room luxury inn located in the heart of Sedona. Visit our website for Sedona Hotel packages, location, and things to do!